In these early learning years, children’s primary attachment is with adults (parents, caregivers or teachers) who use child-directed language. Adults use simple sentence constructions with a great deal of redundancy and make efforts to elaborate on the child’s language attempts and to repair communication breakdowns. 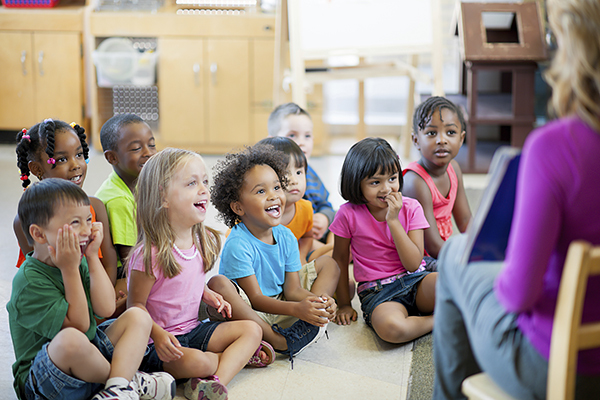 At the same time, preschoolers are more ready to socialize, and interaction with their peers increases. These youngsters are developing the ability to communicate their needs and thoughts and begin to control their environment through the use of their developing language. As they play with peers, they are beginning to learn how to deal with conflict and how to solve problems. They are becoming sensitive to other children’s feelings and are developing a basic understanding of their own emotions and how to regulate themselves. A great deal of social development occurs through fantasy play and imagination. Create an experience books to prepare child for social events or field trips and then review often. Directly teach, model and reinforce social and play language as well as appropriate interactive behaviour! Help child develop sharing and cooperation strategies. 1. Felling Games for Early Childhood. http://www.kidlutions.com/feelings_games.html. Kidlution, www.kidlutions.com, founded by Wendy Young, aims to help children and adults who care about them deal with behavioural and emotional issues. Products build social-emotional skills that are predictors of happiness in life. Games and resources designed for children, parents, teachers and mental health professionals. 2. Story books about hearing loss are available through many of the hearing aid and cochlear implant manufacturers. 3. Oliver Gets Hearing Aids from Phonak. (Free download). Oliver is struggling at school and home to hear his friends and family. He sees an ear doctor who checks his hearing and fits him for hearing aids. Oliver loves his hearing aids and how much they help him. 4. Oliver Gets FM from Phonak. (Free download) Even though Oliver is wearing his hearing aids, he is having a difficult time at school. His audiologist suggests an FM system. Oliver couldn't be happier about how helpful his FM system is at school and at home. 5. Book Boosters! www.rule-the-school.com. Companion to Oliver Gets Hearing Aids and Oliver Gets FM- 25 activities that build self-advocacy, language and literacy skills. 6. Sort and Say Feelings www.superduperinc.com. Students talk about their emotions while matching a feeling tile to feeling scenes.